86 A4 sized pages of text plus a card cover, 60 period B&W photos, 29 walk-round type colour shots, 12 diagrams from official manuals, 4 pages of 1/72nd scale plans (fold-out) and 4 pages of full colour art-work for colour and markings. Covers a lot more than just the Ta 152 and its prototypes, art-work by Petr Stepanek is a big improvement over previous editions. 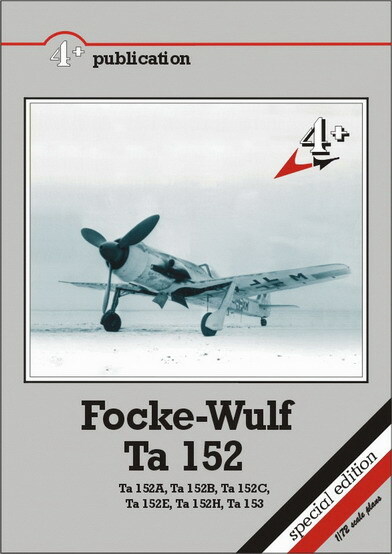 Previous references of the Ta 152 have mostly been part of bigger volumes devoted to the Fw 190 and although that is one of my favourite aircraft, it is good to see a standalone book for the Ta 152. The first 4+ publication book I bought was on the Fairy Fulmar (4+013). I was very impressed and have bought several more since. Amazingly, as good as that first one was, they've got even better! The text was in reasonably good English, very readable and interesting. The period photos were very good quality plus relevant and the “walk-round” shots were as good as any I've seen, most being in colour. The only area where improvement was possible was in the art-work which was in line-drawing form with shading to depict the different colours but still well done. I don't have their Fairy Gannet title (4+023) but borrowed it recently and was amazed to find the art-work in colour. It looked to be computer generated but still a big improvement over the original. The art-work in this volume (4+025) is better again. It's credited to Petr Stepanek and its gorgeous, showing weathering, modifications and reflections in a very realistic manor. Within a short two page introduction, mention is made of Hohenjager 1 and Hohenjager 2. Hohenjager 1 was an attempt by the Luftwaffe to improve the mid to low altitude performance of the Fw 190 A which was being over-taken by the likes of the Spitfire Mk IX and the P-51 Mustang. It included plans for a Ta 152 A and B but neither went into production because of hesitation on the part of the RLM and their interest in Focke Wulf's main rival, the Me 209, which itself failed. Hohenjager 2, was far more successful, ran along side the former and was planning for a high altitude fighter, an all-weather fighter-bomber and included the likes of the Ta 152 H, Fw 190 C, Ta 152 C, Fw 190 D and others. The Fw 190 C had a startling performance but was defeated by the lack of a reliable turbo-charger and on-going problems in sealing the cockpit. The Ta 152 C almost got into production and would have beem a formidable opponent if it had and the Ta 152H went into production but few got operational before the war's end. The Fw 190 D-9 not only went into production, got opperational but was considered the best in the Luftwaffe arsenal. These chapters take up almost half of the book with many period B&W photos of the prototypes plus illustrations from the manuals. Next are chapters on operations of the Ta 152 H and post-war history followed by a technical description of the airframe and armaments. 1/72nd scale plans on a two page fold-out spread showing most but not all of the prototypes and a chapter on colours and markings with four pages of colour profiles by Petr Stepanek with descriptive captions. As far as I know, there is only one Ta 152 in existance today and it's an “H” model in pieces at the National Air and Space Museum's storage facility in the United States so the “walk-round” photo section is not as extensive as others in the series. However, what is there is in colour, very clear, relivant and with interesting captions and with a few wartime B&W photos and several diagrams thrown in it's about as complete as you are going to get. In my opinion the mark of a good reference book is one that causes you to pull out some old kits and think “Hmmm, I think I could have a go at this”. That's exactly what this book did for me. The Dragon 1/72 scale Ta 152 C and MPM's Fw 190 C V18, though not the best kits around, are somewhat unique in the scale and might just get built yet. Choices are available in 1/48 scale too, and Pacific Coast Models has announced a Ta 152 in 1/32 scale too. Nice timing for your next modelling project perhaps! Thanks to 4+ Publications, for the review copy.